Please note these pages are intended as a helpful portal to help you identify potential funding options. Funding programs change over time. If there is a program you are interested in, please always review the webpage of the individual funding program to access the most accurate and up-to-date information regarding eligibility, program requirements, solicitation dates, awarded projects, etc. Many state and federal agencies offer grants to improve water infrastructure, restore habitat, green urban areas, capture and conserve stormwater, and clean up groundwater; some agencies also offer low-interest loans and, at times, loan forgiveness. A convenient way to keep track of grant funds that become available under Proposition 1 (and, more recently, Propositions 68 and 84 under “Propositions/Bonds”), which fund many of the current grant programs, is to visit the state's Bond Accountability website periodically here for project solicitation notices. The Bond Accountability website organizes the information by program. One can also subscribe to the Proposition 1 listserve to be kept informed by email of relevant information. Subscribing to the CNRA Bonds and Grants listserve will also be useful. Finally, one can view a master schedule which is regularly updated that tracks each of the bond programs. Another valuable source of information on grants and loans is the California Financing Coordinating Committee (CFCC) website. The CFCC was formed in 1998 and is made up of seven funding agencies: five state and two federal. CFCC members facilitate and expedite the completion of various types of infrastructure projects by helping customers combine the resources of several agencies. Project information is shared between members so additional resources can be identified. CFCC members conduct free Funding Fairs statewide each year to educate the public and potential customers about the different member agencies and the financial and technical resources available. The tabs below give more detail on various types of grants and loans programs. Available materials which describe the programs and the process by which to apply for funding should be read carefully and directions should be followed closely. Additionally, the California Infrastructure and Economic Development Bank's (IBank) Infrastructure State Revolving Fund (ISRF) Program is a useful low-cost financing tool for public agencies, including special districts, assessment districts and joint powers authorities, as well as non-profit corporations sponsored by public agencies. Eligible projects include but are not limited to city streets, drainage, water supply and flood control, environmental mitigation measures, parks and recreational facilities, sewage collection and treatment, and water treatment and distribution. ISRF Program funding is available in amounts ranging from $50,000 to $25 million, with loan terms for the life of the project up to a maximum of 30 years. Sources of financing repayment may include enterprise revenues, general fund revenues, property assessments, Mello-Roos, special taxes, and other recurring revenues acceptable to IBank. The IBank's Small Business Finance Center also offers loans through its Farm Loan Program. Funds can be used for, among other things, operating and production expenses, equipment, and soil and water conservation. The Coastal Conservancy and the Santa Monica Bay Restoration Commission (SMBRC) announce the availability of grant funds for projects that advance the goals and priorities of the Santa Monica Bay Restoration Plan. The State Water Resources Control Board, Division of Financial Assistance administers various financial assistance programs, including loans and grants for constructing municipal stormwater capture and use and/or stormwater treatment facilities, sewage treatment facilities, and water recycling facilities; improving public water systems; groundwater cleanup projects; watershed protection projects; and for non-point source pollution control projects. Each program briefly described below has its own guidelines, application process and funding cycle. Many grant programs receive funding currently from Proposition 1. For the latest information, access the State Water Board's Division of Financial Assistance website at http://www.waterboards.ca.gov/water_issues/programs/grants_loans/ and the summary of funding programs at http://www.waterboards.ca.gov/water_issues/programs/grants_loans/docs/dfa_funding_summary.pdf. Applications for many programs can be submitted through the Financial Assistance Application Submittal Tool (FAAST) at https://faast.waterboards.ca.gov/. Some grant programs may offer the opportunity to submit pre-proposals via FAAST for early feedback; potential applicants are strongly encouraged to do so in order to develop proposals that are consistent with the funding program's guidelines. Potential applicants should subscribe online to the funding program's announcements and updates sent via email. Sign-up at: http://www.waterboards.ca.gov/resources/email_subscriptions/swrcb_subscribe.shtml#financial. Proposition 1 requires the State Water Board to operate a multidisciplinary technical assistance program for small disadvantaged communities, and allows for the State Water Board to fund technical assistance (TA). The State Water Board's Office of Sustainable Water Solutions was created to promote permanent and sustainable solutions to help ensure effective and efficient provision of safe, affordable, and reliable drinking water and wastewater treatment services. The Office is focused on addressing both financial assistance and TA needs, with a focus on Small Disadvantaged Communities (DACs). The Office provides direct assistance to potential funding applicants, as well as contracting and coordination with external TA providers. Assistance may involve project coordination and development, legal assistance, engineering, and environmental analysis, and/or leak detection/water audits. The application deadline is continuous. In 2017, the U.S. Environmental Protection Agency (EPA) launched the Water Finance Clearinghouse, a web‐based portal to help communities make informed financing decisions for their drinking water, wastewater, and stormwater infrastructure needs. The Clearinghouse provides communities with a searchable database with more than $10 billion in water funding sources and over 550 resources to support local water infrastructure projects. It consolidates and expands upon existing EPA-supported databases to create a one-stop-shop for all community water finance needs. The Water Finance Clearinghouse was developed by EPA's Water Infrastructure and Resiliency Finance Center, an information and assistance center that provides financing information to help local decision makers make informed decisions for drinking water, wastewater, and stormwater infrastructure to reach their public health and environmental goals. Planning and implementation projects meeting the priorities and preferences in the funding guidelines. Implementation project types include green infrastructure, storm water capture and use, and storm water treatment facilities. Final design and planning for the project are among eligible expenses. Some funds may also be available through the Clean Beaches Initiative Grant Program. Cooperative Implementation Agreements (with Caltrans) Caltrans compliance with MS4 and TMDL requirements allows for Cooperative Implementation Agreements (CIAs) between the Department and other TMDL responsible parties, such as local municipalities, to design and construct BMPs needed to address TMDLs in priority watersheds. In return, Caltrans receives compliance credits at a cost of $88,000/credit. No match is required. Contact Constantine Kontaxis, Constantine.Kontaxis@dot.ca.gov for information about this program. Planning and construction of water recycling distribution, storage, pumping, treatment, including groundwater recharge facilities and spreading basins. The Water Boards' Nonpoint Source (NPS) Program administers grant money it receives from United States Environmental Protection Agency through Section 319(h) of the Federal Clean Water. These grant funds can be used to implement projects or programs that will help to reduce NPS pollution. Projects that qualify for funding must be conducted within the state's NPS priority watersheds. Project proposals that address Total Maximum Daily Load implementation and those that address problems in impaired waters are favored in the selection process. 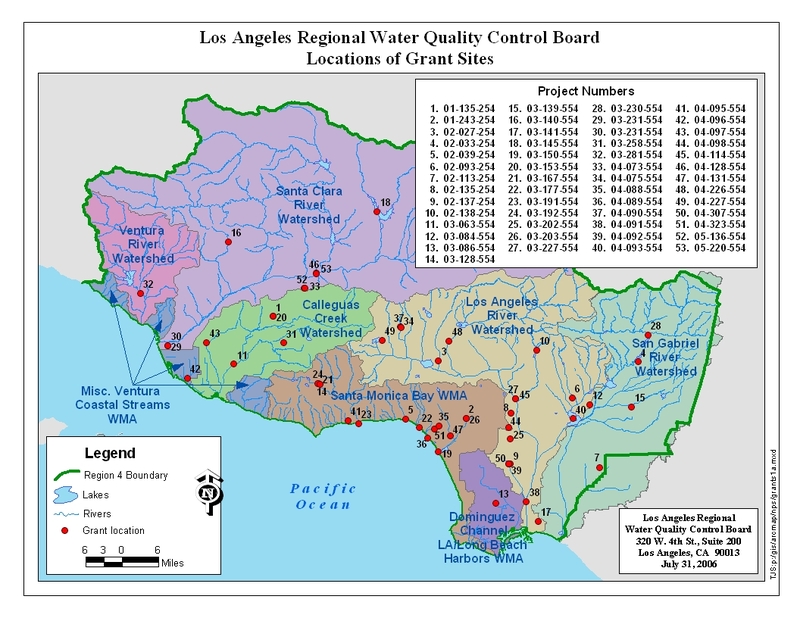 Priorities in the Los Angeles Region focus on implementing nutrients and pesticides TMDLs at individual farms or regional sites in four watersheds. Projects must address treatment, storage, conveyance or disposal of agricultural drainage that threaten waters of the State. Eligible Applicants include any city, county, district, joint powers authority or other political subdivision of the State involved with water management. Application deadline is continuous. The Agricultural Drainage Management Loan Program, created by Proposition 204 and distributed through the Agricultural Drainage Management Subaccount, provides loan and grant funding for Drainage Water Management Units. Drainage Water Management Units are land and facilities for the treatment, storage, conveyance, reduction or disposal of agricultural drainage water that, if discharged untreated, would pollute or threaten to pollute the waters of the State. This program is available to any city, county, district, joint power authority, or other political subdivision of the State involved with water management. Application deadline is continuous. Planning and/or construction of projects that return public water systems to compliance with drinking water standards, consolidation, water meters, treatment projects, and replacement of aged water transmission or distribution mains, groundwater wells, or other infrastructure. Application deadline is continuous. Includes, but not limited to: bottled water, well repair, well rehabilitation, and replacement vending machines, point of use devices, (for example, filtration) hauled water, emergency interties, treatment systems, etc. Application deadline is continuous. Planning, design and/or construction of publicly-owned treatment facilities including wastewater treatment, local sewers, sewer collectors and interceptors, septic to sewer conversions, storm water reduction and treatment, and water reclamation facilities; planning, design and/or implementation of nonpoint source projects or programs and estuary conservation and management plans; and water/energy audits, water/energy reduction devices, water meters and water reuse projects. The application deadline is continuous. A project must be included on the Project List (PL) to be approved for CWSRF financing. The PL is generally updated on a quarterly basis. No action is necessary on the applicant's part to have a project added to the PL. The Division of Financial Assistance (DFA) will make arrangements for projects to be added to the PL once a complete or partial application has been submitted. If you plan to submit an application for CWSRF financing, DFA recommends that you start by submitting the General Information Package to obtain a project number and a Project Manager. The General Information package will give the Division sufficient information to add your project to the PL. The State Water Board also has loan (principal) forgiveness available for CWSRF Green Project Reserve (GPR) projects. GPR projects must address water or energy efficiency, mitigate storm water runoff, or encourage sustainable project planning, design, and construction. Clean Water State Revolving Fund-eligible wastewater projects (see above). Application deadline is continuous. Planning/monitoring and implementation of projects that will prevent and clean up contamination of groundwater that serves or has served as a source of drinking water. Regulatory directive issued, and responsible party lacks financial resources to implement response to directive. Grants: Reasonable and necessary costs incurred by the grant recipient for investigation or cleanup groundwater contamination. Contracts: State or Regional Water Board determination of contaminant source, investigation, or cleanup. Application deadline is continuous. Provides low-interest loans to local agencies for the design and construction of publicly owned facilities necessary to protect groundwater quality in basins threatened by seawater intrusion, which are subject to a local groundwater management plan, and where restrictions on groundwater pumping, a physical solution, or both, are necessary to prevent the destruction of, or irreparable injury to, groundwater quality. Application deadline is continuous. Underground storage tank owner and/or operator meeting requirements of small business and who are in compliance with specific regulatory requirements. Grants: Costs necessary to upgrade, remove or replace project tanks to comply with requirements. Loans: Finances up to 100% of costs necessary to upgrade, remove or replace project tanks, including corrective actions, to meet applicable local, state or federal standards. Application deadline is continuous. Current or former owner and/or operator of the underground storage tank that caused an unauthorized release, unauthorized release confirmed by the local regulatory agency, named a responsible party and directed to clean up the contamination, and party incurring the cleanup costs. Reimbursement is limited to $1,000,000 per occurrence less the applicable deductible. Application deadline is continuous. A number of grant programs currently being funded by Proposition 1 feature an extensive list of priorities for grant funding including urban greening, water conservation, and habitat restoration. Without specifically being focused on improving water quality, it is likely these types of multi-benefit projects will result in some level of water quality benefits, which may be quantifiable. Projects that develop stormwater capture systems that reduce marine debris, reduce non-point source pollution, and allow for the storage of freshwater. Wetland restoration and protection projects at impaired watersheds that promote healthy nursery habitat for aquatic species and provide water quality improvements. Projects that remove barriers to fish passage in addition reduce water quality impacts to coastal waterways. Projects that prevent or reduce water pollution or contamination. Projects that protect and restore coastal watersheds (bays, estuaries, nearshore ecosystems) including those that restore ecological health and natural system connectivity, which will benefit local water systems and help defend against sea-level rise. Projects must be multi-benefit watershed and urban rivers enhancement projects in urban watersheds that increase regional and local water self-sufficiency. Projects must be multi-benefit within the Ballona Creek Watershed. Priorities include resource protection, habitat protection, and urban greening. WaterSMART Water and Energy Efficiency Grants provide cost-shared funding for projects that save water; increase energy efficiency and the use of renewable energy in water management; support environmental benefits (i.e., make conserved water available instream or otherwise address endangered species issues); mitigate conflict risk in areas at a high risk of future water conflict; and accomplish other benefits that contribute to water supply sustainability in the western United States. The program seeks to help local residents and their organizations, particularly those in underserved communities, restore their urban waters in ways that also benefit community and economic revitalization. Multiple agencies offer grant programs which feature habitat restoration as their main focus. However, there may be ancillary water quality benefits from undertaking the restoration, particularly when restoration involves streams or wetlands. Many of these grant programs are currently funded by Proposition 1 and require matching funds, often of non-State origin. These types of projects may be an opportunity to partner with other entities to obtain multiple sources of funding that might lead to more quantifiable water quality gains from habitat restoration. Proponents of projects listed in the workplan for the Southern California Wetlands Recovery Project may want to pursue these types of funding. Protect and increase the economic benefits arising from healthy watersheds, fishery resources and in-stream flow. Implement watershed adaptation projects in order to reduce the impacts of climate change on communities and ecosystems. Protect and restore aquatic, wetland and migratory bird ecosystems including fish and wildlife corridors and the acquisition of water rights for in-stream flow. Fulfill the obligations of the state of California in complying with the terms of multiparty settlement agreements related to water resources. Remove barriers to fish passage. Collaborate with federal agencies in the protection of fish native to California and wetlands in the central valley of California. Protect and restore rural and urban watershed health to improve watershed storage capacity, forest health, protection of life and property, storm water resource management, and greenhouse gas reduction. Protect and restore coastal watersheds including but not limited to, bays, marine estuaries, and near shore ecosystems. Reduce pollution or contamination of rivers, lakes, streams, or coastal waters, prevent and remediate mercury contamination from legacy mines, and protect or restore natural system functions that contribute to water supply, water quality, or flood management. Assist in the recovery of endangered, threatened, or migratory species by improving watershed health, instream flows, fish passage, coastal or inland wetland restoration, or other means, such as natural community conservation plan and habitat conservation plan implementation. Assist in water-related agricultural sustainability projects. Funds will be focused on addressing the objective of providing and protecting enhanced stream flow, especially in those streams that support anadromous fish; special status, threatened, endangered or at risk species; or provide resilience to climate change. While not intended to directly address water quality or habitat improvements, some funding sources may help potential grant applicants enlarge on a green streets project intended to address water quality issues or otherwise improve their community. Three grant programs are available: Urban Forest Expansion and Improvement, Urban Forest Management Activities, and Urban Wood and Biomass Utilization. Construction of green infrastructure projects is not eligible. Projects must sequester significant amounts of greenhouse gases over a 40-year period. May fund development of urban forest management plans.